Steve Saretsky is a Vancouver Residential Realtor and author behind one of Vancouver’s most popular Real Estate Blogs - Vancity Condo Guide. Steve has become one of the most followed Vancouver Real Estate personas on social media, hosts an online video series ‘The Saretsky Show’, and authors a weekly newsletter to several thousand readers. Following a recent announcement from the Bank of Canada to hold interest rates firm at 1.25%, the latest round of economic data for Q1 2018 was published. A rather disappointing day for the Canadian economy with GDP growth trickling in at an annualized pace of 1.3%, well below the expected 1.8% GDP growth estimate. This really shouldn’t come as a surprise. As Real Estate goes, so too does the economy. 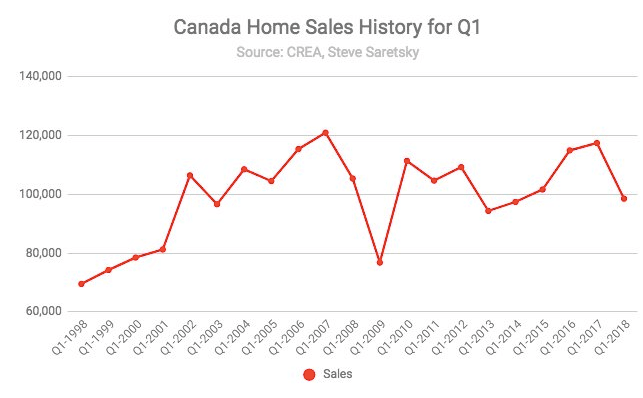 National home sales slid 16% in the first quarter of 2018 with the average sales price also declining by 6.27% from Q1 2017. It was the first negative percentage decline since Q1 2009. The slowdown is starting to spread across the real estate industry where a sluggish real estate market and higher interest rates spurred Housing investment to fall by an annualized 1.9%, the worst showing since the first three months of 2009. Much of the pullback was felt from a drop in ownership transfer costs, down 13.5%. But it’s not just Real Estate brokers who have felt the pinch. Households facing higher interest payments are showing some fatigue. Household spending increased 0.3 per cent, the slowest pace since the first quarter of 2015. Spending on goods such as automobiles has stalled after almost three years of gains. This will be important to watch moving forward as any slack in the real estate and credit markets has a larger impact on indebted households who tend to cut consumption and build savings as home equity drops. A 2010 study of the Great Recession in the sixteen OECD countries by Reuven Glick and Kevin Lansing shows that countries with the largest increase in household debt from 1997 to 2007 were exactly the ones that suffered the largest decline in household spending from 2008 to 2009. Saint and the Builders of Tomorrow?